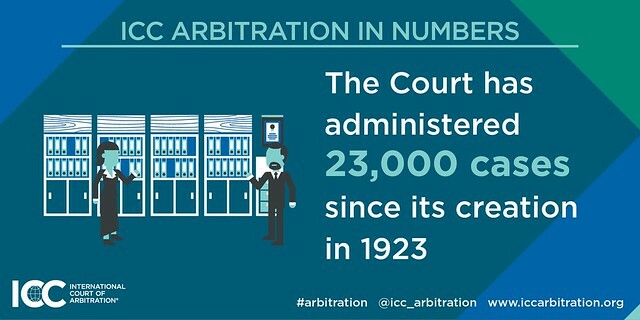 Preliminary statistics released today by the International Court of Arbitration of the International Chamber of Commerce (ICC Court) reveal a record number of countries represented in ICC Arbitration cases filed in 2017. According to the latest figures, a total of 810 new cases were filed in 2017 – slightly lower than the 966 cases filed in 2016, which included 135 cases related to a set of very small claims in a collective dispute. Cases filed in 2017 involved 2,316 parties from a record 142 countries, compared with 137 countries represented in 2016. Newly-registered cases represented an aggregate value in dispute of over US$ 30.85 billion in 2017, while the average amount in dispute in new cases stood at US$45M with over 60% of all cases filed having an amount in dispute exceeding US$2 million. The 1,548 pending cases at the end of 2017 represented an average value in dispute of US$ 137,325, 630. The statistics also revealed a record number of draft awards approved by the ICC Court (512) and a rise in the number of arbitrators appointed or confirmed by the ICC Court – from 1,411 in 2016 to 1,488 in 2017. The number of States and State entities that were parties to arbitral proceedings initiated in 2017 rose to over 15% from 11% in 2016. Four cases were filed on the basis of a Bilateral Investment Treaty that listed ICC Arbitration as one of the dispute resolution options available to the parties. To date, the ICC Court has administered 39 cases based on Bilateral Investment Treaties. In 2017, the ICC Court saw an increase in the total number of women arbitrators. Women arbitrators represented 16.7% of all arbitrators nominated or appointed by the parties, co-arbitrators or by the Court. This represents an increase from 14.8% of nominations or appointments made in 2016. In 2017, of 1,488 arbitrators nominated or appointed, 249 were women, representing 85 nationalities. This compares with 209 of 1,411 arbitrators in 2016. The Court appointed a higher percentage of women (45%) than the parties themselves (41%) and the co-arbitrators (13.7%). Mr Mourre said: “We will now double our efforts to significantly increase gender and regional diversity both in our appointments and in the Court’s membership”. The Court disclosed statistics on the gender balance of ICC tribunals for the first time in 2016. Both the number of cases (87) and the number of parties (153) from Sub-Saharan Africa reached record highs in 2017. These figures represent a growth rate of 35.9% for cases and 40.4% for parties compared with the previous year. North and Sub-Saharan Africa each saw an increase in the number of arbitrators with nationalities from those regions. Representing a growth of over 26% from 2016, 219 parties featured in ICC arbitrations in Central and West Asia in 2017. Iran, Kazakhstan, Qatar, Saudi Arabia and the United Arab Emirates all ranked in the top 50 countries both in terms of case numbers and number of parties represented. Collectively they represent over 15.5% of total parties. Statistics for 2017 also reveal an increase of close to 8% in the number of cases from Latin America. Following the establishment of a case management team in Sao Paulo last year, Brazil rose to 7th place in case rankings worldwide, with 51 cases compared with 36 in 2016. Nine cases are currently being managed by the Sao Paulo team. Oceania saw a marked increase of 25% in new cases filed and a 3.4% growth in the number of parties represented. Figures also show a rise in the number of arbitrators appointed or confirmed by the Court from the region from 49 in 2016 to 56 in 2017. North and West Europe meanwhile accounted for 784 parties, representing a growth of 4.8% from 2016. Figures also reveal a marked increase in the number of British (219) and French arbitrators (141) representing growth of over 14% and 9% respectively. Next in the ranking of number of arbitrators by nationality was Switzerland (116), the US (100) and Germany (99). The ICC Court’s global footprint is set to increase further in 2018 with a new case management office of its Secretariat in Singapore due to be launched in the Spring and a new representative office of the ICC Court that recently opened in Abu Dhabi. The number of challenges introduced in 2017 fell slightly to 48 from 50 in 2016. Only six challenges were accepted by the Court. In 2017, upon the request of one of the parties, the ICC Court communicated reasons related to three challenges, and one request for consolidation. Following the introduction of Expedited Procedure Provisions (EPP) in the 2017 ICC Rules of Arbitration, 50 requests to opt in were submitted. Of these, 10 resulted in an agreement to EPP involving 20 parties from 16 countries. Three of these cases were concluded within the six-month time limit from the case management conference established under the 2017 Rules. “These figures are very encouraging. They show that the EPP are an effective response to the legitimate time and costs concerns of the business community,” Mr Mourre said. ICC’s emergency arbitrator procedure saw 21 cases involving 58 parties from 31 countries filed in 2017 – down slightly from the 25 cases filed in 2016. A further eight cases have already been recorded in 2018, bringing the total number of filed emergency arbitrator cases to date to 78. A full breakdown of ICC Dispute Resolution Statistics will be made available in the ICC Dispute Resolution Bulletin later this year. The Bulletin, offered free of charge to ICC members, is also available for purchase from the ICC Digital Library.